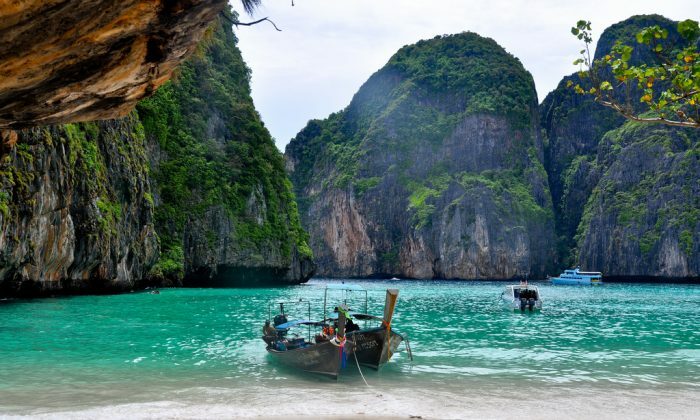 BANGKOK—Thailand’s Maya Bay, made famous by the film “The Beach”, will close to visitors for four months from June to allow its coral reefs to recover from the environmental impact of thousands of visitors each day. Up to 5,000 visitors go to the beach every day, says Thailand’s tourism agency, travelling by speedboat and ferries to Maya Bay, which is sheltered by 100-meter high cliffs. The closure from June 1 is a bid to salvage the area’s coral reefs, which have been damaged by an increasing amount of tourist activity in the area.